I don’t like to admit it but Fall is just around the corner. 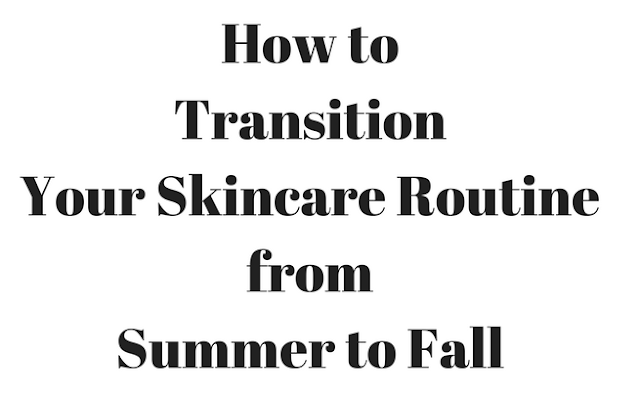 That means switching my skincare routine from summer into fall for the best skin. Summer skincare is all about sun protection and oil control, fall brings its own challenges, repairing the damage during all that summer fun, and keeping skin protected from the drier, cooler air of autumn, and prepared for the (sigh) colder months ahead. Summer damage can lead to dead cell buildup on your skin, which can make it feel rough and look dull. It’s important to exfoliate regularly to keep a fresh complexion. It’s also important to use a gentle exfoliation method that won’t irritate or strip your skin of moisture. Use a Konjac Cleansing Sponge! It’s an all-natural exfoliant that’s gentle enough for everyday and enriched with skin-clarifying charcoal: perfect for a little at-home facial. See my review on DEW Puff Konjac Cleansing Sponges! They are great! Fall is a great time to introduce a body scrub once or twice a week to get rid of dry, itchy patches caused by the change in climate. If your face feels extremely dry and taut after you wash, it could mean that your cleanser is actually stripping your skin of its natural oils —which can lead to more dryness and clogged pores. For the fall, look for a gentle cleanser that doesn’t over-dry the skin. Aveda Purifying Gel Cleanser is enriched with chamomile, lavender and antioxidant vitamin E, leaving your skin feeling soft, refreshed and lightly scented. It’s is a great choice for fall, because it removes makeup, dirt, and excess oil, all in one step while leaving your skin hydrated and nourished. It also works on a variety of skin types, whether your skin is oily and acne-prone, dry, mature, or combination. Depending on your skin type and climate, consider switching to a creamier morning moisturizer and a richer night cream to give your skin an extra boost of that much-needed moisture. Don’t be afraid to layer for much needed moisture. A serum is a nice addition to your skincare routine, because it moisturizes, nourishes, and repairs. After washing your face, apply a thin coat of Serum, allow it to soak in for a few minutes, and then apply your moisturizer on top to lock in hydration. I like E.L.F Soothing Serum it uses Purified water, Jojoba, Aloe, and Vitamin E to sooth and protect skin and it’s also rich in antioxidants including Shea Butter and Grape. Just because the days are shorter and the sun’s rays are less intense, you shouldn’t skip sunscreen in the fall. Sun damage can happen even when there’s cloud cover! So make sure to cover your face, neck, hands, and any other exposed areas with at least SPF 15 to prevent UV damage. A long, hot shower can feel great on a chilly day but it can actually wreak havoc on your skin, stripping away oil and leading to parched, dry skin. Lower the water temperature to warm and keep your bath or shower short. When getting out of the shower, pat (don’t rub) your skin and apply a moisturizer while skin is slightly damp. I love Burt’s Bees Vitamin E Oil as soon as I get out of the shower (after patting skin dry), vitamin E, wheat germ oil and sweet almond oil join forces in this rich formula to help soothe, condition and seal in your skin's moisture.